Jupiter is back! The giant planet is up all night through September, rising a bit before sunset and transiting before midnight. Jupiter’s been in the news a lot lately. I’m sure you’ve seen the stories about the Black Smudge – the result of an impact of a comet or meteor, discovered in Jupiter’s south polar region by an Australian amateur astronomer. Unfortunately, a few weeks after it was discovered the spot spread out and became very difficult to see, and by now you probably won’t be able to see it at all. But of course there are plenty of other things to see on Jupiter. I was intrigued by a note in the RASC Observer’s Handbook: Jupiter with no Galilean satellites at 9:43 pm on the night of September 2. But all the Jupiter simulators I’ve checked say that Europa will be transiting then, while Ganymede and Callisto will still be visible slightly off the limb. Still, take a look and see if the simulators are wrong and the RASC is right. It’ll be a lovely view anyway, with Ganymede hanging right off Jupiter’s limb and gradually moving into the limb, very closely followed by its shadow, while Callisto moves further from the planet. Neptune spends September just a few degrees to the east of Jupiter, while Uranus, at opposition on the 17th, trails about an hour and a half behind. Pluto transits around nightfall and sets a bit after midnight, so it’s findable but you’ll have to work at it. Venus and Mars are in the morning sky, while Saturn is hiding behind the sun. There’s some manmade satellite action in the shallow sky this month, too. Cassini continues to impress: last month it sent back images of narrow towers above the ring plane, held in place by one of Saturn’s seemingly endless fleet of tiny moonlets. Check it out if you haven’t already seen the image. And the LCROSS mission is on its way to impact the moon, where it will crash into the moon on October 9. I’ll talk about that more in next month’s column. Meanwhile, the NASA spacecraft STEREO A makes its closest pass to L4 on September 10, while its partner STEREO B passes by L5 on October 26. 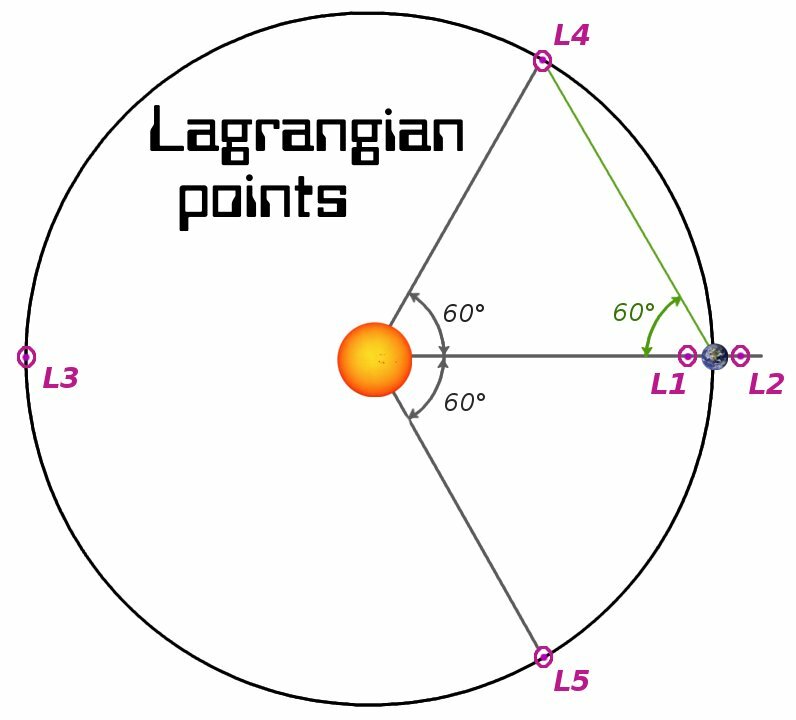 A and B, it turns out, stand for “Ahead” and “Behind” – since the L4 Lagrangian point precedes Earth by 60° while L5 follows it by the same amount (see diagram). I described the Lagrangian points back in June – stable points in Earth’s orbit, and a nice place to park spacecraft. But we amateur astronomers are observers. I wondered, where are the Lagrangian points in the sky? Where would you look if you had a big enough telescope to see one of these satellites? Of course, the first three are no-brainers. For L1 and L3, look directly toward the sun. There are several spacecraft at L1 – SOHO, for example, which has discovered lots of new comets as well as its main mission of observing the sun. For L2, look the other way, toward the antisolar point. There are several spacecraft there, like WMAP, which has been studying the cosmic microwave background radiation for years now. There’s also a new spacecraft there on a similar mission: Planck, “the coolest thing in space”. Its sensitive detectors need to be kept very cold, so they’re refrigerated to cool the detectors down to -272.9°C, only a tenth of a degree above absolute zero. Okay, the first three Lagrangian points are easy. How do you find L4 and L5? Well, obviously they’re in the plane of the ecliptic, so that narrows it down. But where on the ecliptic? If you look at the diagram, you’ll notice that 60° angle centered on the Sun that defines L4 andL5 also defines an equilateral triangle. Draw a line from Earth to either of those points, and you find it’s also 60° away from the Sun. So all you have to do is sweep from the Sun’s position forward or backward along the ecliptic 60 degrees. What if you want the actual coordinates? There’s a way of doing that too. Most astronomy programs let you enter new solar system objects by specifying their “orbital elements”. If you’ve ever tried that – perhaps with a new comet – you know it can be a bit tricky, since orbital elements don’t follow any standard and there are lots of different systems in use. But for the Lagrangian points you can use shortcuts. For a quick approximation, pretend the Earth’s orbit is circular: semi-major axis 1.0AU, eccentricity 0, inclination 0. The next two, ascending node and “argument of periapsis” or similar name (everyone seems to name that one differently), specify where the orbit rises above the ecliptic and where perihelion is. For a circular orbit on the ecliptic plane, neither of these matter, so set them to 0. That leaves you with two elements that specify where the object (or in this case, the region of space) is at any given time. Some systems call this “Mean anomaly at epoch”. “Epoch” just means the time when you know the object’s position. “Mean anomaly” is a little harder: it’s the object’s position along its orbit if you assume the orbit is circular. That may sound silly – most planetary orbits aren’t actually circular – but orbits are a lot easier to calculate if you start with the mean anomaly and then make all the extra corrections later. Aieee! That sounds complicated! But here’s all you really need to know: Earth’s mean anomaly is 180° at the time of the vernal equinox each year. If you were specifying Earth’s position, you could specify a mean anomaly of 180 and an epoch date of the most recent vernal equinox: 3/20/2009 11:44 UT. Wait – why 180 and not 0? Isn’t zero defined by the vernal equinox? It is – but zero is the Sun’s position from the Earth at the vernal equinox. In this case, you want the Earth’s position from the Sun. Plug that into your astronomy program and you’ll find that L5 sets just past 10pm. L4 rises at 2am; it’s about 10° east of Mars. Of course, this is all an approximation since it began by assuming a circular orbit. It also ignores factors like perturbations from other planets. But it should get you close enough that you can point your hypothetical super-telescope and start sweeping around ...and it’s certainly close enough if you just want to gaze in the right direction and wonder what STEREO is seeing now!